In forum theatre ‘finding the light at the end of the tunnel’ involves seeing the story transform and evolve into a positive ending. It also involves the exploration of different options for responding to oppression and ultimately engages everyone in deep, transformative, and creative self-exploration. Like Amelie, all of the participants in the interGEN older adult project expressed their joy in being part of the first performance of ‘C’mon Granny.’ Many of them felt they took risks, and delved into uncomfortable spaces, only to feel more comfortable and connected by the end of it. As one participant said, “he had set his feet on chaos!” another found comfort in “finally being able to see the light at the end of the tunnel.” However, the light continues to shine and expand in many different directions, as the interGEN project continues to engage more youth and older adults in different communities and contexts. It’s not too late to join and have your chance to play your part. 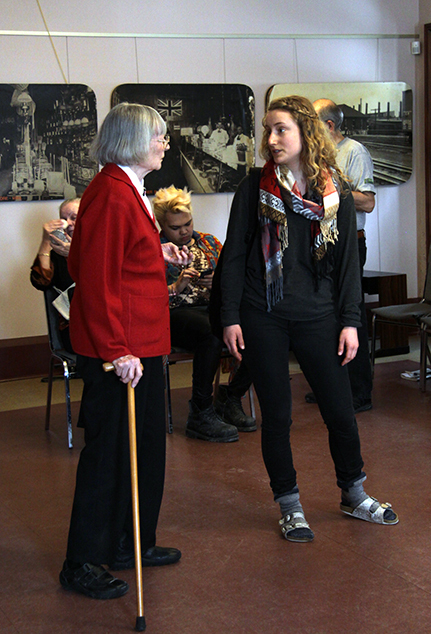 Kate and her Granny, Lucille, will perform again today, alongside a new performance created by a group of youth in Toronto: together they will tell each other their stories—and everyone will have the opportunity to join this intergenerational dialogue. The performance will begin at 6 pm at Urban Arts in Toronto. This post was contributed by Amelie Sterchi– (Currently working at MCT through an international Student internship from Switzerland), and Christina Parker (Volunteer researcher for MCT’s interGEN project).